It’s been a long time since I’ve even thought about Kellyanne Conway. The once omnipresent White House mouthpiece seems mostly to have slunk back to her rock crevice of late, but for some sporadic appearances on Fox News. But according to yet another BOMBSHELL TELL-ALL about the various havoc underway at Trump HQ, we’ve allegedly got Conway to thank for the tasty bits of gossip filtering through the airwaves. Thanks, Kellyanne, you’ve proved to be (very) marginally useful. Ronald Kessler, author of the impending Trump book The Trump White House: Changing the Rules of the Game, spoke with CNN’s Jake Tapper on Tapper’s State of the Union show on Sunday, revealing he got a lot of his juiciest goss from one particularly fruitful Conway interview. 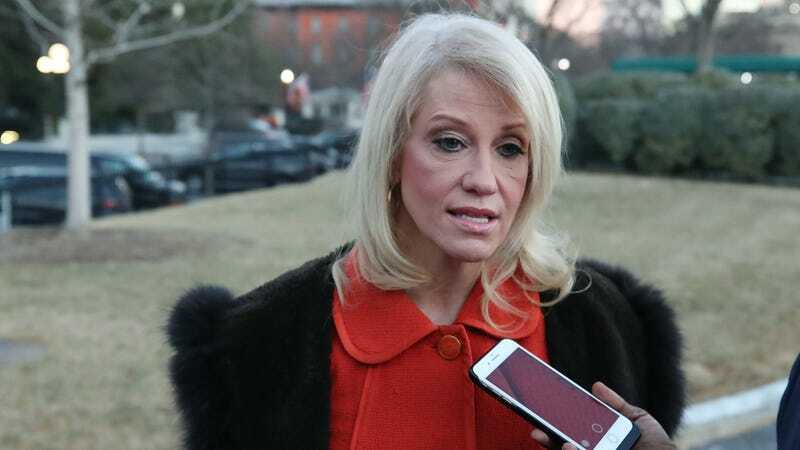 “While I was interviewing Kellyanne Conway at the White House, she forgot that she was on record, and she started lashing into Reince Priebus,” Kessler told Tapper, per the show’s transcript. “She said the most mean, cutting and obviously untrue things about Reince. And I didn’t include them in the book because they were so unfair,” Kessler said. Goddammit, dude, way to tease us with the trash and not deliver. I’d hoped it would be Tiffany Trump playing the Alien chestburster that lurked inside the Trump administration, but it makes sense that Conway’s unable to keep the White House secrets (and it explains why her hair’s so thin.) Though she’s been inexplicably tasked with solving the opioid crisis, it’s not a gig that lets her do nearly as much truth gymnastics as, say, White House Press Secretary, or Chief of Staff. Whenever I’m underutilized at work, I tend to waste a lot of time gossiping and complaining about my bosses and coworkers on Slack, so, you know. I get it.